December is a time to eat, drink and be merry. How do you enjoy the spirit of the occasion and not end up feeling snowman shaped at the end of it? For each day we have space to record your plans and also what is fixed for December. The key at the top has a colouring in vibe helps you to focus each day on your priorities and the colour code to help you keep plan easily. It will help you to personalise the calendar and focus on the things that are important to you. Let us start with the things that are fixed. You will see my Menstrual Cycle Tracker (MCT) code in the top left hand corner for each day – – | – – This is a simple way to track where in your cycle without over sharing to the world. Pop over to the Period Tracker calculator on my website to calculate your cycle dates and a wee summary on your menstrual cycle. You probably want to note what is changing. That is usually day 1 and day 14 and any times you know yourself a wee bit of tlc is required. Either circle the MCT dates on the planner or use one of the colouring in boxes to highlight what your action is or how you want to feel. You may celebrate a few of these days or perhaps all of them and you may have a few added extras with lunches or party nights out too. In your menopausal years, you can become more sensitive to stress and carbs. It is easy to overload on both in December so remember to include whatever activities reduce stress levels for you and make them a priority. An overload of carbs, particularly alcohol based ones can often exasperate pms symptoms, hot flushes and interfere with your sleep. You may want to deliberately plan for alcohol free days to help your body recover. December can be one of the quietest times in a gym. Personally I am always happy about that! I can book into classes easily and have the gym to myself when I go to train. Your normal exercise routine can easily go out the window with a busier diary and bigger to do list. Sometime the simplest thing is to decide to take a few weeks off and reduce stress levels rather than trying to cram everything in. Exercising an home is a easier option for many. Keep active by achieving 10,000 steps, which you may easily do with all the running around. There are many lovely treats at this time of the year. As we have a finite amount of calories to spend each day we have to make a decision otherwise “Hello Snowman” come January! What decisions are you making with food treats this year? Enjoying your food is part of a healthy diet. 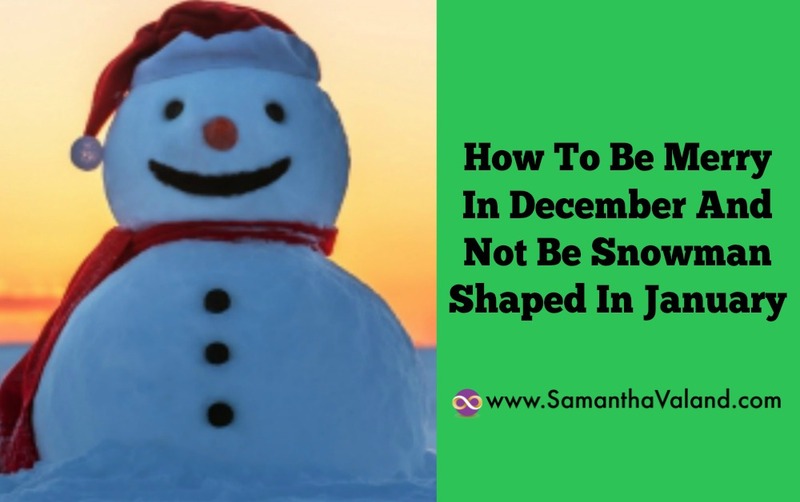 Living with such an abundance of food requires us to make decisions in order to eat, drink and be merry without becoming snowman shaped in January.